The Northern Trust Open is currently going on from Riviera Country Club this week out in California. and while there is a load of talent in the tournament, we are going to take a moment to loo ahead to next week’s World Golf Championships event, because it is truly one of the most unique events in sports, and one of the most fun to watch in golf. 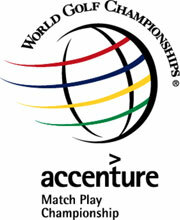 It’s the Accenture Match Play Championship, with the top-64 players in the world qualifying in four different brackets, just like you see in the March Madness tournament in College basketball. Yes I know, it’s 68 teams now, but really, everyone knows the tournament unofficially begins after the play-in games. Anyway, the Accenture match play tournament works just like the NCAA college basketball tournament, with four No.1 seeds spread across the four brackets, all the way through to the No.16 seeds in each bracket. players match up with each other one vs. one and go head-to-head. However, stroke play is not what determines the winner. It’s match play. The best score on the hole wins it, and if its a tie, then they move on. The match goes until the player in the lead is up by more holes than there are remaining. Match play is certainly a different frame of mind for these players to enter into than the four-day stroke play events. For one, this event starts on Wednesday, so we all get an extra day of golf. For another, players only worry about the player in their pairing. Hunter Mahan defeated Rory McIlroy last year in the Accenture Match Play event for arguably the biggest win of his career. It’s an enormous win for any player to get, with the championship match played over 36 holes on Sunday. The final seeding for the event will not be determined until the Northern Trust Open has concluded. The seeding goes by World Golf Rankings. Currently, the No.1 seeds for the tournament would be McIlroy, Tiger Woods, Luke Donald, and Brandt Snedeker. Snedeker got into the top-four of the golf rankings last week after a victory at the AT&T Pebble Beach Pro Am. This entry was posted in Opinion and tagged accenture match play, brandt snedker, dove mountain, hunter mahan, luke donald, northern trust open, pga tour, rory mcilroy, tiger woods, world golf championships on February 15, 2013 by Bryan.